Opinion Forum » Hail to the Chief! Of What? When He appears officially it is played. Who is the Chief? Of what? Writing about Hail to the Chief here, I observed that President Obama is the chief only of the military. We Some may have chosen him as the Chief for the Nation — probably thinking little about it — but he is not. He is the Chief only of the military. He is the Chief of the neither the legislative nor the judicial branches, two allegedly co-equal branches of Government. He seems to despise them (as well as the military of which he is constitutionally the chief, only) when they do what they are supposed to do and to accept them only when they do what he wants them to do for political purposes. There is a big difference and when they don’t, he obfuscates or lies about it all. What a good little President! But be not concerned. 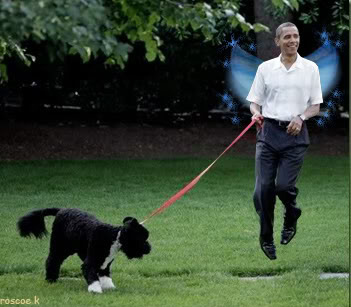 Bo (aka FDOUS), the presidential canine companion, will lead the way. He could do a better job of it and probably should.